Missed the Bullet Hole. Damn. I have to give props to the Super 8 in Cameron, MO: nicest motel on this trip so far. The king-sized bed was plush, the air-conditioning icy cold and refreshing, the wireless internet worked without a hiccup, and the coffee was superb. Oddly enough, I’ve noticed that with the budget motels, the nicer ones are usually found in smaller towns along the interstate, whereas the inner-city ones often leave much to be desired. I guess it’s all about presentation – when you’ve been driving on the road for hours and you’re considering your overnight choices, you’re going to want a motel that looks decent from the outside, at least. I enjoyed my brief stay there, and I slept like a rock. Got about 7.5 hours, by far the most for any night since I’ve been gone. I took my time this morning. I was planning on a rendezvous in Lincoln, Nebraska that could not occur until 10:30 at the earliest. Since it was about a 2.5-hour drive, I didn’t leave my motel until 8:10. That turned out to be a big mistake – more on that in a minute. My friend Mike, who actually lived in northern Missouri for four years (who knew? ), told me that St. Joseph was worth a short detour because of “the Jesse James and Pony Express stuff.” I guess I’m not up on my history of the old west, because I had no idea what he was talking about until I googled it. Turns out the house Jesse James was shot in has been preserved and turned into a museum – cool! The actual hole from the bullet that killed him can be seen on one of the walls. Or could be seen, if the museum had been open, but it didn’t open for another 90 minutes or so and I had a pressing engagement in Lincoln. I walked around the outside, taking a few pictures, and then drove a couple of blocks to the National Pony Express Memorial. It’s the site of the first Pony Express mail delivery service in 1860. 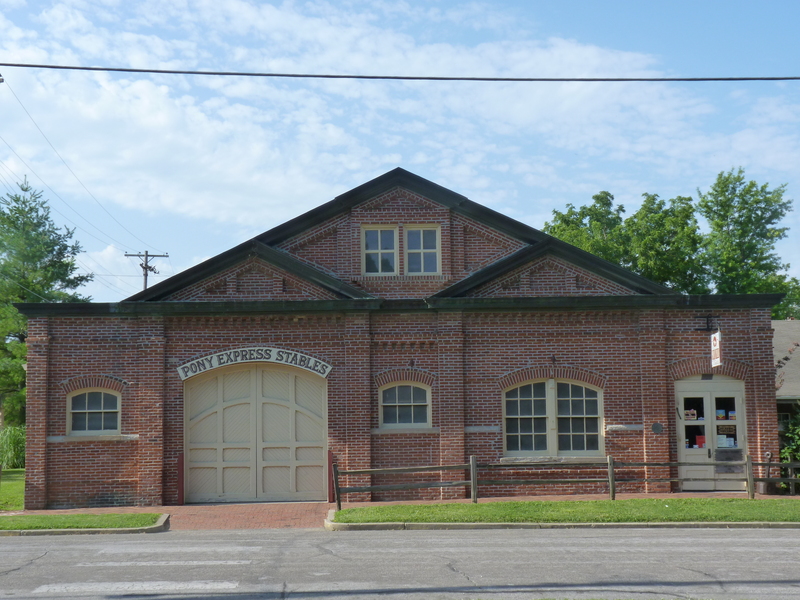 I was actually impressed with St. Joseph – the downtown looked very historic, with lots of fashionable old brick buildings – so I can’t say I was completely turned off by Missouri. I’ve mentioned all the high water and flooding I’ve encountered during this trip. It’s been everywhere: lakes, rivers, fields, streams, etc. 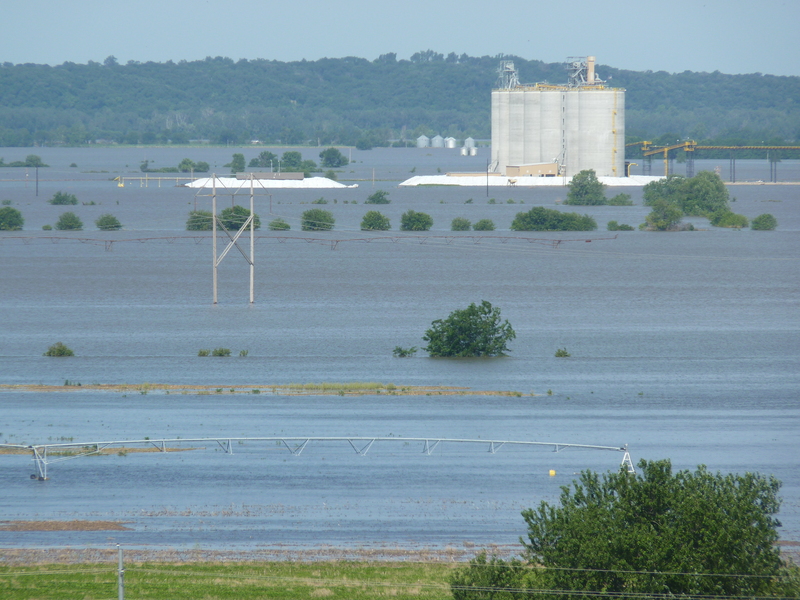 Still, I was caught off guard while speeding north on Interstate 29 when I spotted water from a flooded field practically lapping at the side of the road. And then I glanced to the left, and saw an incredible sight. 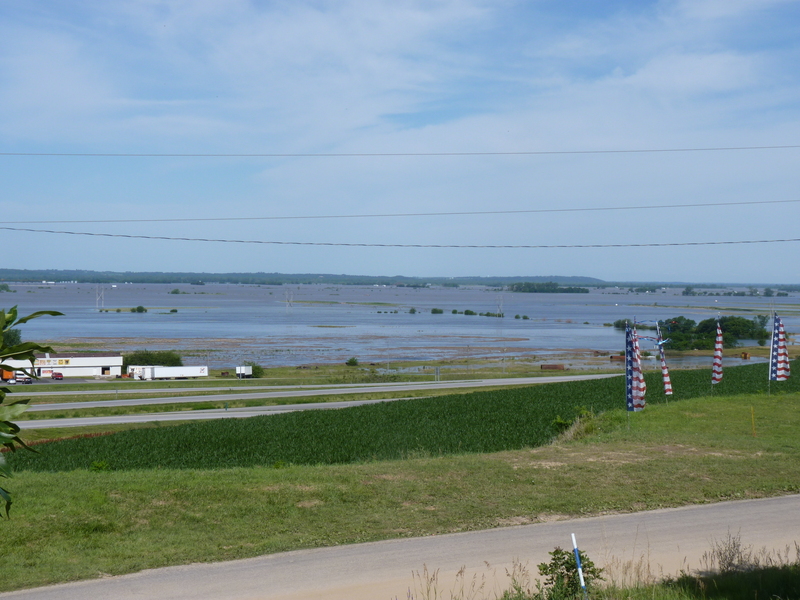 Miles and miles of flooded farmland. 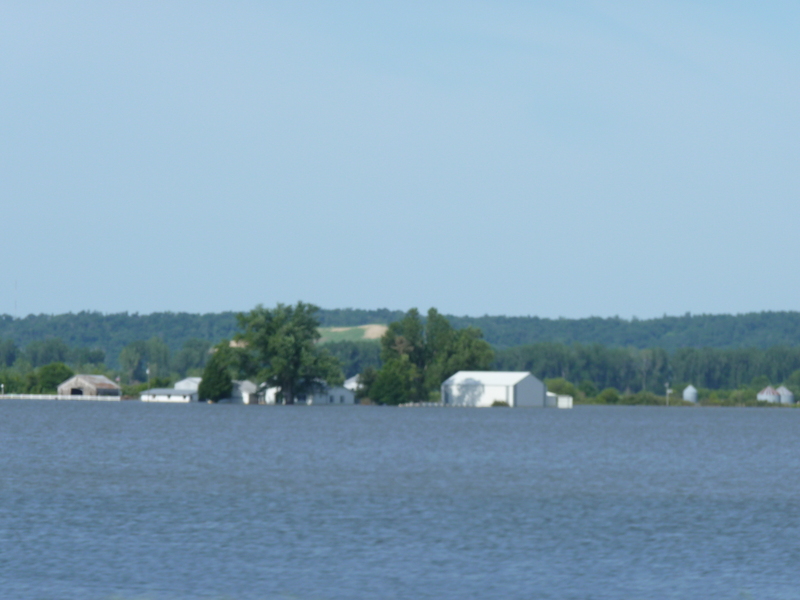 Houses, barns, and grain silos were all underwater, thanks to the raging and swollen Missouri River. I took as many photos as I could while racing down a highway with the windows open. And then, I spotted a detour sign. It turned out that I-29 was closed due to flooding. I was forced to exit the freeway and ended up on a major detour through the Missouri countryside. Missouri gave way to Iowa – I wasn’t even supposed to be back in Iowa on the return leg of this trip! – and the minutes ticked away. I was afraid I would miss my lunch date in Lincoln, but fortunately the detour finally took me back to a section of I-29 that was open. 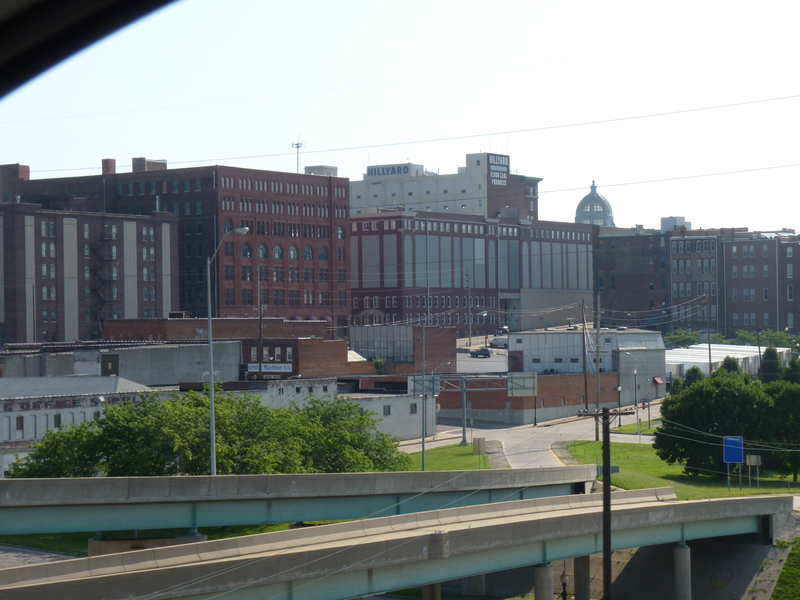 I then crossed the troublesome Missouri River on Interstate 80 West, through Omaha. Lincoln was dead ahead. I was two hours behind schedule, but better late than never! I Didn’t Know Chickens Had Fingers! Before I set out on my journey, there were two regional fast-food establishments I wanted to try: White Castle and Raising Cane’s. 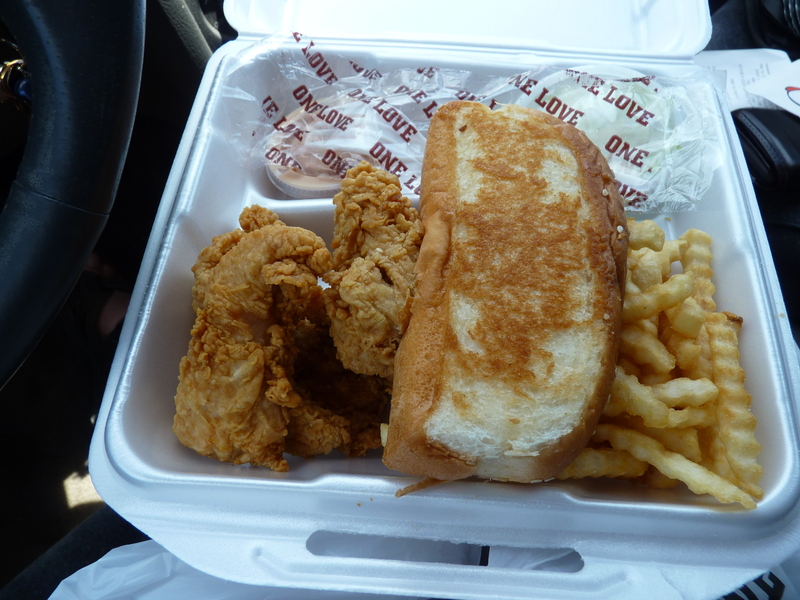 Everybody knows White Castle, but I had never heard of Raising Cane’s until reading about it through a friend’s blog. She was always raving over their chicken and, especially, the Cane’s Sauce. 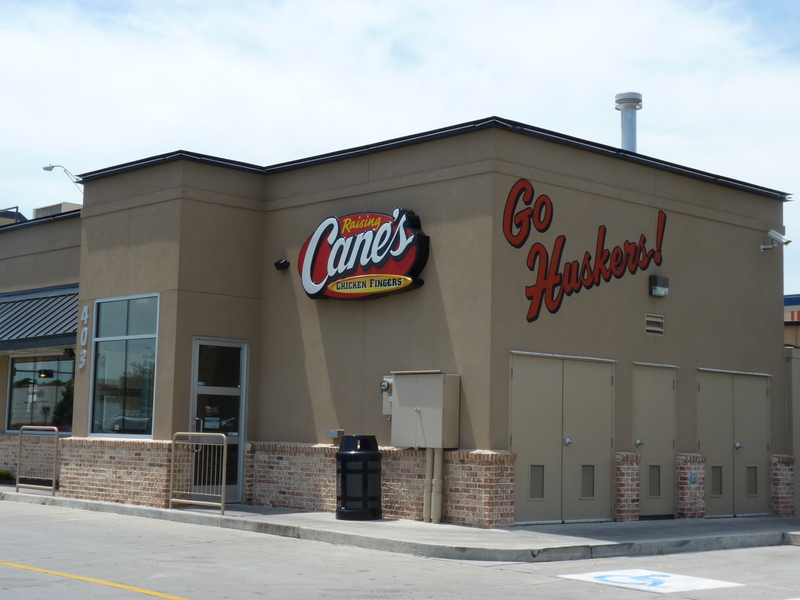 Raising Cane’s is just as elusive to find as White Castle – I mapped them out, and there were only two possible locations along my entire route: Lincoln, Nebraska or Fort Collins, Colorado. The timing worked out so that I would pass through Lincoln right after they opened for an early lunch. Then, of course, the damn river went and flooded. Turned out to be nearly 1:00 before I got there, but that’s the prime lunch hour anyway. I ordered “The Box” combo and ate it in my car. Raising Cane’s serves one thing only: chicken fingers. And I have to say, their chicken fingers are awesome. Crispy on the outside, moist and juicy inside. And sure enough, their Cane’s Sauce – used for dipping – elevates them to incredible status. I was trying to figure out what’s in the sauce. It’s the color of Thousand Island, so there’s probably ketchup and mayo. And it’s got hints of vinegar, dill, allspice and coriander. Whatever, it’s awesome. My meal came with cole slaw, fries, Texas Toast and a drink. Even though downtown Lincoln turned out to be a bit of a detour, it was worth it for the opportunity to try this place I’d been curious about. About an hour west of Lincoln, the sky grew gunmetal gray and ominous. I’ve already come to associate that with impending thunderstorms, and sure enough, I encountered those again while driving down I-80. It rained for awhile, and I was treated to some spectacular lightning displays, and then the storms passed and the sun came out again. I ended up pulling off the freeway in Sidney, Nebraska. Ode to my cat! LOL. Cheyenne was still another 100 miles away, and I beat my record for most miles traveled today. I was in no mood to continue. Because of the detours, I am well behind schedule now and won’t make it home on July 4th as planned, but my parents have agreed to watch the kids on Tuesday so I’m not concerned about it. I should arrive home late in the day on the 5th. In Sidney, I finally found a Motel 6! Actually, I tried the Days Inn first, but they wanted $97 for a room. Considering I just paid $39 at the Days Inn in Dayton, I felt this was outrageous and walked out. There was a Motel 6 right next door, and they’re charging $69. Still a bit pricey, but what are you going to do? As I was checking in, the clerk took my driver’s license and said, “Good afternoon, Mr. Parsley.” I was shocked. My last name is Russian for parsley…but nobody knows that. It’s the first time in my life I’ve ever gotten that. The clerk laughed and remarked how funny it was that I had to travel all the way to Nebraska for somebody to know the meaning of my name. The Motel 6 is actually pretty nice, and – surprise! – it’s got a laundry room. I had to shovel about fifty bucks in quarters into the machines for detergent, a washer, and then a dryer, but it’ll be worth it to finally have fresh, clean clothes! If I survive the night, that is. Turns out there’s a Tornado Watch in effect for this area until 10 PM. It’s sunny right now – and very windy (gotta love the northern plains!) – and it smells like cow manure. We’ve got some thunderheads building up to the northwest, it looks like. We’ll see what happens. Tomorrow? I’m pointing my car in the direction of Salt Lake City and seeing how far I get. 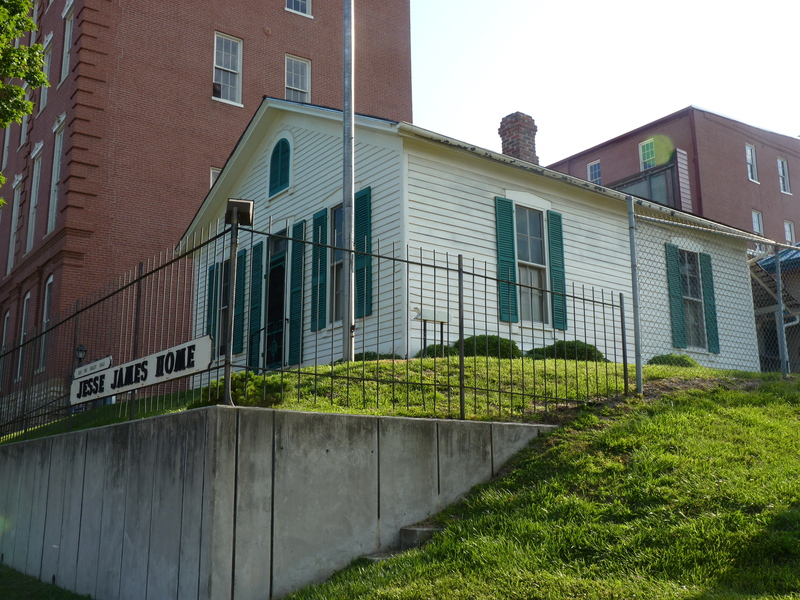 The house where Jesse James was shot and killed - St. Joseph, MO. Pony Express Memorial in St. Joseph, MO. Downtown St. Joseph from my car window. This is where Interstate 29 in Missouri was closed due to flooding. You can see water encroaching on the freeway on the right side of the photo. 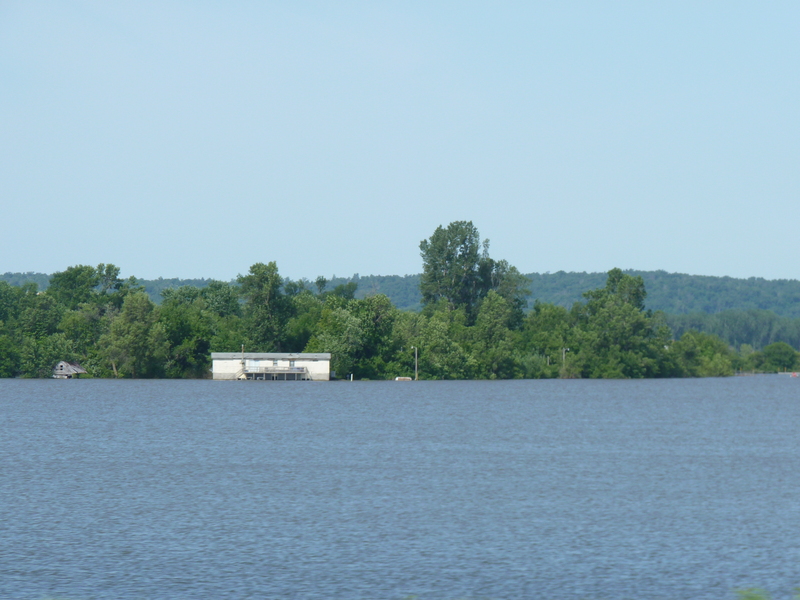 Flooded home along the Missouri River. Yikes. This is not good. Raising Cane's does one thing, and they do it really well: chicken fingers. Wish we had this chain back home! 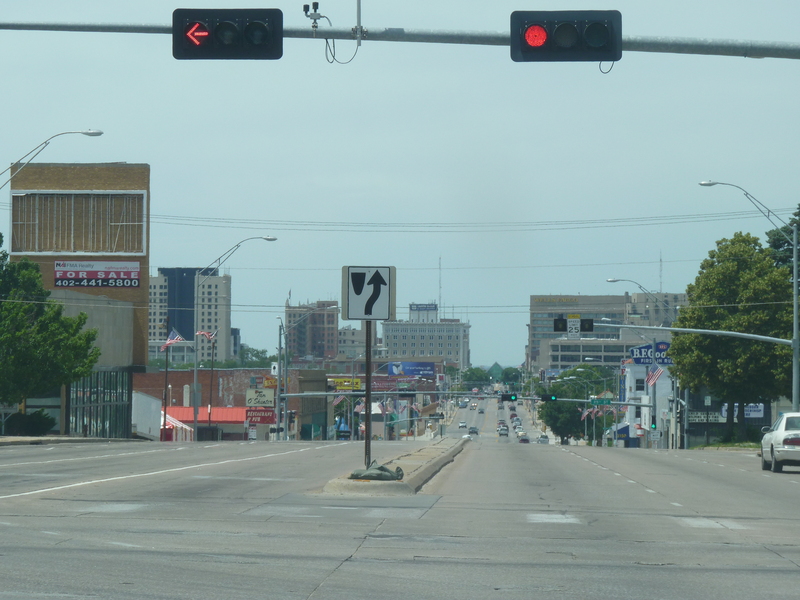 Weirdest thing about Nebraska: their stoplights are all sideways! With all its fame and mystique, the Pony Express was in business for only a year. Really, that’s all? I had no idea! Maybe if I’d actually gone inside the museum I’d have learned that. Thank God you’re not still going commando! I’m going to miss these posts when your trip is finished. I think you need your own TV show. We got a phone call from the woman who’s licensing Denver Book Review yesterday, saying don’t buy a non-refundable airline ticket for Ross — Nebraska is flooding. Oy. For the record, I never actually went commando. I just considered it. Today was great – I got to wear shoes and socks again. It’s the little things! I briefly thought the whole town of Sidney was going to flood last night. Okay, Philadelphia needs a Raising Cane’s in the city because that chicken you ate looks faaaaaabulous! Loved this set of photos, Mark. The one of the Pony Express is awesome! Salt Lake City. I can’t WAIT to see your photos of that. Happy and safe journey, buddy! I wish I could have gone inside the Pony Express Museum. At the same time, considering how the rest of the day unfolded, I’m glad I did not – I wouldn’t have made it as far as I did. Yay for chicken fingers, yay for clean clothes, yay for having a good night sleep! Boo for all the flooding…yikes!! The weird thing is, I didn’t even realize chickens had fingers!! But mmm…they sure are good. We have Raising Cane’s here in Lexington, as well. Glad you enjoyed your chicken fingers. And, indeed, the lights in that last photo are strange! Sorry you won’t make it home for the 4th. Have a safe drive today! Lucky you!! I won a free Texas Toast, redeemable on my next visit. Since there won’t be a next visit for years probably, I’d be happy to send it your way if you want it! Funny I’m reading this at breakfast time, but now I just want chicken fingers. Looks good! It’s never too early (nor too late) for chicken fingers! Oh–the flooding pics are heartbreaking!! !